NRLT is applying for funding through the Cornell Lab of Ornithology Land Trust Small Grants Program to expand our Early Birders Program. Early Birders introduces children to bird watching and promotes an appreciation for nature, conservation, and habitat protection. The Early Birders program began in 2018 with a grant from the Virginia Department of Game and Inland Fisheries Virginia Wildlife Grant Program. With the grant, we purchased 30 pairs of binoculars and 12 bird guides to create a “birding kit” available to teachers, scout leaders, and youth organization leaders to check out free of charge from our office. We also led bird outings and visited schools with the kits. 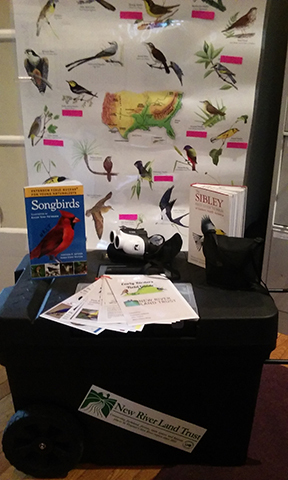 If we receive the Cornell Lab grant, we’ll add new birding kits for groups to borrow free of charge from libraries in 3 areas: the City of Galax, Giles County, and Floyd County. We’ll also offer bird outings and trainings throughout the region. In 2018, Early Birders introduced bird watching to hundreds of children through outings and public school events. If your group is interested in Early Birders, please contact our Conservation Coordinator.